Tim Burton crafts an interestingly subversive tale of a unique creation taken in by big business that requires outsiders to free it so it can reach its full potential away from a heavy-handed creative monopoly. When Dumbo hits theaters this Friday, April 29th, a bulk of its audience will be one drawn in by nostalgia. Nostalgia for the original 1941 traditionally hand-drawn animated feature film about a baby elephant with giant ears who finds with the help of a magic feather he can fly. But also nostalgia for the early films of director Tim Burton. Burton, who made his name in the 80’s and 90’s writing and directing the adventures of outsiders who overcame their limitations and hang-ups to blossom into the hero they always held within them. What is Edward Scissorhands if not the 1960’s nuclear family parallel to Dumbo? On paper, having Burton direct a circus tale around an extraordinary outsider seeking acceptance seems like putting peanut butter and jelly together; a sure-win combination. However, while Dumbo is arguably Burton’s best film since 2003’s Big Fish, it’s not without its quirks and odd choices. Burton’s Dumbo eschews most of the original Disney film and centers largely on the struggling Medici Family Circus set in the rural Midwest of 1919. Here, the owner and ringmaster, Max Medici (Danny DeVito) struggles with dwindling crowds in the wake of the Great War and the loss of his star act of cowboy and cowgirl wranglers, the Farriers. As the patriarch of the family, Holt (Colin Farrell) returns to the circus after serving for the United States, he has now lost an arm to war and a wife to influenza. This leaves him alone in charge of his kids, Millie (Nico Parker) and Joe (Finley Hobbins) as he struggles to find Max has sold his horses to invest in a new star of the show; a pregnant elephant Mrs. Jumbo and her soon-to-be born calf. Baby Jumbo’s debut at the circus turns out to be a bust due to its comically large ears as he is rechristened Dumbo by the jeering crowds. But while Dumbo is jeered and his mother branded a mad elephant for standing up for him, Hoit’s science-loving daughter Millie thinks she can train him to fly via the scientific method, a gamble that pays off when it draws the attention of V. A. Vandevere, (Michael Keaton) an iconoclastic entrepreneur who wants to make Dumbo the star of his futuristic, art-deco themed amusement park, Dreamland. But is Vandervere the savior the people of the Medici Circus have been hoping for, or something far more nefarious? The first act of Dumbo, which largely rehashes the plot of the animated film, is fairly ham-fisted in hitting the beats of the original film; to the point with delivering the story it feels the need to tell by hitting beats minus an emphasis on character moments. It feels very perfunctory, in getting us from point A to B, with an evil roustabout whose only goal seems to be not much more than an evil roustabout there to hassle our default hero, Hoit, and his family. It’s disappointing that the opportunity here to fully flesh out a circus sideshow freak world doesn’t seem to hold much appeal to Burton. There are a few character moments, but only Hoit’s daughter, Millie, Hoit, and Max Medici really get any character moments beyond basic character traits masking as a personality. Considering how many character moments Burton imbued into his Red Triangle Circus Gang in 1992’s Batman Returns or in 2007’s Big Fish, it’s sad to say that much of this is a wasted opportunity. It is only once Keaton’s Vandermere shows up with Eva Green’s Collette in an attempt to purchase Dumbo, that the film becomes something more unique and readily watchable. Collette (Eva Green) is largely the film’s answer to Timothy; she’s there to ride the flying elephant in the Hippodrome style circus at Vandermere’s Dreamland park at his insistence. One of the film’s most readily odd choices is the way that the film approaches Keaton’s Vandermere. Vandermere is a very obvious beyond pencil-thin pastiche of Walt Disney, (his monogrammed initials seen in his office form a very obvious W to make this even more on the nose) with Dreamland serving as a schitzo-would-be Disneyland. This is one of the statements Burton’s film is clearly making without question, that Disney and his machine are evil because they take unique creatures and run them into the ground or keep them on display en vogue until they end up trapped in a Nightmare world. It’s a very odd subtext that speaks maybe more to Krueger and Burton’s experience with Disney and maybe Burton’s way of saying he’s done with the House of Mouse. Regardless, its fascinating in an odd way; this version of Disneyland sells Dumbo stuffed plushes as soon as he’s in their stable but also praises science in a play on Tomorrowland, while also having a freakshow version of Frontierland called Nightmare Island. Regardless, once the film starts, it’s very hard to divorce Vandermere from the pastiche of Walt Disney he’s parodying. Its an on-the-nose critique but one that Keaton tries to make work by making him something of a pastiche of Willy Wonka by way of P.T. Barnum with shades of his turn as Ray Kroc in The Founder. And largely, this works. Keaton brings the movie to life and functions as a great foil to Hoit’s kids who are the true protagonists of the film. Dumbo doesn’t speak, so Millie is largely his stand-in; providing the audience insight on what he’s thinking while still serving the part of Burton ingenue that actors like Winona Ryder and Christina Ricci play in his earlier films. While still being a trope, it does open up a connection to Burton’s earlier films in an inviting way. Dumbo could very easily have been an Edward Scissorhands type of film in a good way, it doesn’t get there, but at least its in the conversation. Eva Green’s Collette is also an inviting presence in the film. 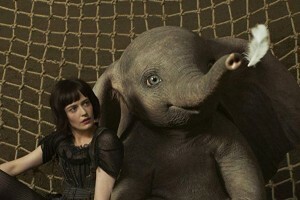 While she’s largely relegated to an eventual love interest for Hoit, it’s her relationship to being a trapeze artist that draws her connection to Dumbo in a way that works beyond her being in the film solely because of her personal connection to Burton as his past muses like Helena Bonham Carter and Lisa Marie. The scenes with her riding Dumbo are unique and some of the more iconic shots in the film. Overall, the story of a Disney creation escaping an ersatz Magic Kingdom is very compelling and the 2nd act of the movie works even without the Disney subtext. There’s also the cool factor of seeing stars from most of Burton’s most loved films together again for the first time in decades. Danny DeVito’s Medici is largely the heart of the film and he imbues the circus characters and locale work with a great performance. Farrell’s character Hoit has a lot of potential, some of which comes through in his performance in the 3rd act, but by and large, he’s not used as well as he could be. For the most part, Dumbo is an interesting feature and creature. He seems fully realized and real on-screen, as does the world of Dreamland. It’s kind of a shame the world around him isn’t a bit brighter and that the warmth of the animated film doesn’t seem as vibrant and realized as it could be. The film’s attempts to adapt the original film are hit and miss, such as a version of the Pink Elephants scene, but when the film does its own thing it’s fascinating and works as commentary and with great iconography. Its Burton’s best film in years, with an excellent Danny Elfman to match and tremendous cinematography. It is a step towards getting a sense of vision and wonder he showcased in some of his classic films that will hopefully continue in films to come. Typo there, fixed now. 1 film, too many Danny’s. Thanks! Thanks for the review, Victor! I want to see it for the circus vibe, Burton art direction, and Keaton’s take on Walt.